NO ONE WHO STUDIES the far-flung, interdenominational holiness movement is under any illusions that they can tie the whole thing up with a bow, giving a summary of all of its aspects in a single essay. The best approximation of this feat is the first chapter of Timothy L. Smith, Called Unto Holiness: The Story of the Nazarenes - The Formative Years (Nazarene Publishing House, 1962). The dean of holiness studies, Smith was a Nazarene scholar of impeccable credentials. The rest of this book is the classic history of one of the largest holiness denominations. William C. Kostlevy has done a great service by producing his well-edited Historical Dictionary of the Holiness Movement (Rowman & Littlefield, 2001). This handy 300-pager is full not only of reliable information but also of vignettes and quirky gems on every facet of the movement. Timothy L. Smith's magnum opus, Revivalism and Social Reform (Johns Hopkins University Press, 1980), forever destroyed the notion that the holiness folk were too heavenly-minded to be any earthly good. Using an impressive battery of primary sources, Smith shows that the benevolent activism of the so-called "social gospel" originated with holiness evangelicals. Melvin E. Dieter's The Holiness Revival of the Nineteenth Century (Rowman & Little- field, 1996) is an insider account that gives a good overview of the movement. Its thesis is that the holiness movement arose from a filtering of Wesley's perfectionist teachings through 19th..century revivalism, For more on how Palmer's teachings and those of other holiness proponents fit into the theological world of American Methodism, John L. Peters's Christian Perfection and American Methodism (Zondervan, 1985) is the book. There are a number of good sources on Phoebe Palmer. Phoebe Palmer: Selected Writings, edited by Thomas C. Oden (Paulist Press, 1988) gives us a panoramic sense of the shape and power of her life and teachings. 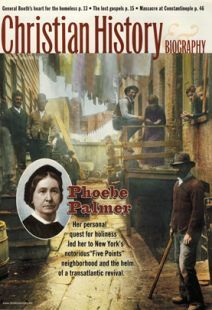 Charles Edward White's The Beauty of Holiness: Phoebe Palmer as Theologian, Revivalist, Feminist. and Humanitarian (Zondervan/Francis Asbury Press, 1986) is an eminently readable survey of Palmer's life from an unabashed fan. Harold Raser's Phoebe Palmer: Her Life and Thought (Edwin Mellen Press, 1987) is a critical intellectual biography that traces the sources and shape of Palmer's teachings. We can only mention a few of the many resources on key holiness figures and denominations. A readable, well-illustrated, and information-packed account of the Salvation Army in United States is Diane Winston, Red-Hot and Righteous: The Urban Religion of The Salvation Army (Harvard University Press, 1999). The fascinating Autobiography of the black holiness evangelist Amanda Berry Smith (Oxford University Press, 1988) is well worth the read. A later, more radical holiness woman gets a thorough and affectionate treatment in Susie Cunningham Stanley, Feminist Pillar of Fire: The Life of Alma White (Pilgrim Press, 1993). The distinctions and the links between the Holiness and Pentecostal movements are well-explained in a number of books. The best telling of the story of how certain "come-outer" holiness groups moved on into Pentecostalism is Vinson Synan, The Holiness–Pentecostal Tradition, second edition (Eerdmans, 1997). On the shift in definitions of the key term "baptism with the Holy Spirit" from early Methodism through the holiness movement and into Pentecostalism, see Donald W. Dayton, Theological Roots of Pentecostalism (Hendrickson, I 987).Two books stand out as guides to the Victorian urban world in which the American holiness movement was born and flourished during its early decades. The first of these is Paul Boyer's Urban Masses and Moral Order in America, 1820-1920 (Harvard University Press, 1978), a fascinating survey covering (among other things) all of the major Christian social initiatives during this critical period, and marred only by a tendency to read religion as a reflection of "more basic" social forces. The second reveals the seamier side of Victorian America, uncovering some of the social worries that shaped middle-class reform during that period. This is Karen Halttunen's Confidence Men and Painted Women: A Study of Middle-Class Culture in America, 1830-1870 (Yale University Press, 1986).